All Facebook business Pages have a couple of drop-down menus. Click the icon to see a variety of links. What regular visitors see through this gear icon on your Page and what you (and any Admin of any Facebook Page) see will be different. Also, if you’re viewing your Page as your Page, you see a different view from the Admin view. Get Notifications: This option turns on notifications for you for this Page so that any time this Page has a new post, you get a notification on your personal profile. Turn on Notifications for Pages that you really care about so you don’t miss anything. But don’t turn on Notifications for every Page you Like or you will be overwhelmed. 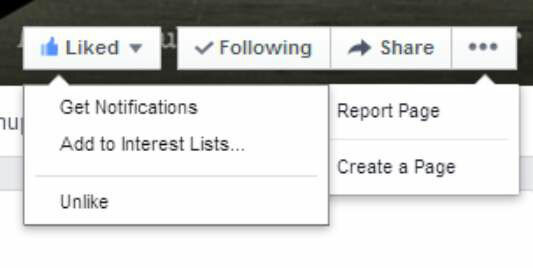 Add to Interest Lists: This option enables you to add the Page to a Facebook Interest List. Using Interest Lists can be a strategy to get your Page seen by a larger audience. This Add to Interest link is seen by anyone on any Page. Unlike: You can Unlike the Page with this selection. Under the drop-down menu shown with the three dots you see a couple of options. Report Page (visible on other Pages, not your own): You can report any Page if you feel that it’s breaking Facebook rules, and other people can report your Page if they feel that it’s breaking Facebook rules. When you click this link, you bring up a dialog box that takes you through the process of reporting the Page. If you don’t see this as a link, you can click the Visit Help Center link and search for Reporting a Page. Create a Page: This is a quick link to go to the interface to create a new Page. Everyone sees this link. Between the two drop-down menus you see two options. Following: You can unfollow a Page you Like which means that you won’t get updates in your News Feed from this Page even though you Like the Page. Share: This option is by far the most important. You want visitors to your Page to choose it! Doing so brings up a post (that you can edit) that appears on their Timelines for all their Friends to see. Go ahead and choose this option on any Page to see what happens. All the information in the post comes from particular fields on the Info link for the Page you’re viewing. If the Page didn’t put information in the Company Overview section (or other fields), there will be no text, just the name of the Page hyperlinked back to the Page. You may want to adjust your own Page after seeing how it looks on someone else’s Page.